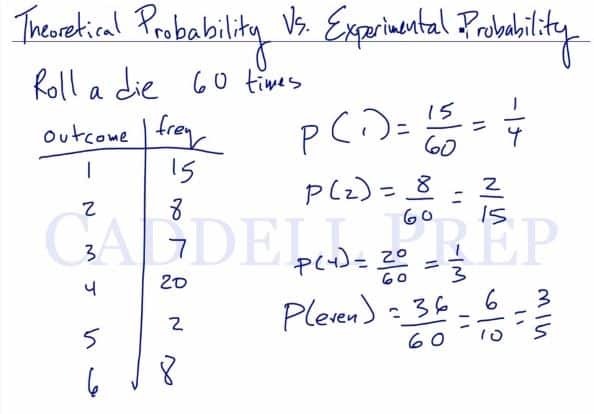 In this video, we are going to learn about the differences between theoretical and experimental probability. Let’s use rolling a dice as an example. Use P to represent probability. Theoretical: The ratio of possible ways that an event can happen to the total number of outcomes. Theoretically, the probability of rolling an even number on a dice ranging from 1 to 6 would be , or simply just . To roll a one, the theoretical probability would be . of rolling one number is the same. Experimental: The ratio of the number of times an event happens to the total number of outcomes. Let’s use the following table to find the experimental probability after rolling a dice 60 times. Experimentally, the probability of rolling a even number would be the sum of the frequency for even outcomes to the total number of trials. To roll a one, the experimental probability would be . Note that the probability of rolling each number is different, as well as when compared to the theoretical probabilities. 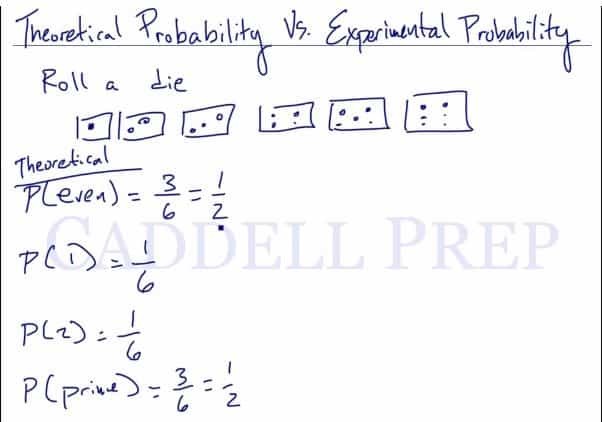 Let’s go over theoretical and experimental probability. In a die, there are six faces with dots ranging from one to six. We have six different side and six different outcomes. If we want to see the probability of rolling an even number, just take a look at my drawing. There are three even numbers out of a possible six numbers. So, the probability of having an even number is . So, this is just the number of the favorable outcomes over the total outcomes. This is different from experimental probability. Experimental probability is based on experiment and data. side, we will have the same frequency. and we will have , times. That’s theoretical. We expect it to be evenly distributed. and we got , times. For whatever reason, came out a lot more than the other numbers. came out times. Experimental probability is based on these outcomes. Based on our experiment, we can say that we can roll a rather than get a . Since came out many times as compared to . which is a lot different from the way we had before. which is a lot less than that we had earlier. Theoretical probability is based on the size equally distributed. However, the experimental probability is based on data from actually doing the experiment and its outcome. Make sure that when you do an experimental probability, you base it on frequency as occurred to the total times it was tried.